Hub Pens have the highest quality for both plastic and metal pens at the lowest price point! 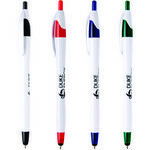 These pens go through an extensive quality control process to ensure that you and/or your customers do not have issues. Hub Pens strive to provide you with the very BEST in writing instruments. The Mateo retractable ballpoint pen features contrasting color combinations and a contoured body for the ultimate writing experience. 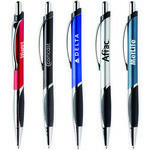 Our Newport Pen features various metallic barrel color options, Customizable with your logo for Brand Recognition. The Nitrous ballpoint pen combines style and function with its ribbed grip and ultra-modern design. Our customizable Patriotic Foiled Forman No. 2 pencil features a patriotic USA barrel and one location for your unique logo imprint. Our Calypso Pen features attractive color options and allows inserting brand logo and message for impressive Company Logo Products. The Chillex Pen features black rubber pillow grip in sculpted accents, Customizable with your logo for Brand Recognition. The Guillox 8 Ballpoint Pen features European decorative metal engraving, Customizable with your logo for Brand Recognition. Our Guillox 8 Rollerball Pen features beautiful silver etched center band and allows adding brand logo and message for a great corporate swag. The Guillox 9 Rollerball Pen features beautiful Guilloche art decoration and allows adding custom logo and message to Promote your Brand. The Javalina Classic Stylus Pen features white body for maximum visibility and allows adding custom details to promote your brand. The Legend Pen features 24 karat gold plated accents and allows inserting custom imprint for Business Giveaways.